Henrietta is a darling. Beautiful, smart, confident and catholic. We were great friends but she had major issues with my book collection. “Olivia you can’t be reading that book now”, she told me again in that tone you use when your younger brother who’s taller than you misbehaves and you know you can’t do very much to him. “Apart from the priest at church advises against it, check out the title. The priest says you might lose your faith. Aren’t you worried at all? No, I told Henrietta I wasn’t worried at all. Every time, afterwards, that I would read a book by Dan Brown, her disapproval would be palpable. Like a third person in the room. Some people’s reservations on ever reading any book by this author is a lot similar to the Ebola pandemonium that gripped my country early yesterday morning- this rumour had started that if one had a bath with very hot salted water(drinking a portion of the same) then they’ll be immune to the deadly Ebola virus! And so a lot of people, some of whom for medical reasons were on a low salt diet, drank heavily salted hot water and had their bath with same. All before 6 am. For some strange reason, this sudden discovery/ cure for Ebola was neither questioned nor verified and as a result 2 people reportedly lost their lives in Plateau State to the truly sad experience. Some people will never read ‘Deception point’ or ‘Digital fortress’ because someone who read or heard about either ‘Angels and demons’ or ‘the davinci code’ concluded that Dan brown’s probably related to the devil. Yes, I know that right in the middle, the books start to feel like an encyclopedia, I also know from the beginning that no matter how hairy the task or how deadly the assassin who’s chasing them, Langdon and his female companion conveniently survive but I’m happy that I made these discoveries myself. And so the faith I have is validated by my experiences and decisions. It isn’t a lecture and so I’m not necessarily looking for a book to make it better(or worse). It will therefore take more than Dan Brown’s novels to make me lose it. Frankly too I doubt that it will make anyone else lose theirs. If it helps at all, what is fact or fiction is clearly stated at the beginning of DB’s books. Plus ‘Deception point’ and ‘Digital fortress’ have zero religious content. Those are real interesting books. I’d recommend them to anyone looking to enjoy a story. Same here..my first Dan Brown was the almighty Dan Vinci Code and I didn’t bat an eyelid when I read it, as a matter of fact, ’twas actually given to me by a catholic! 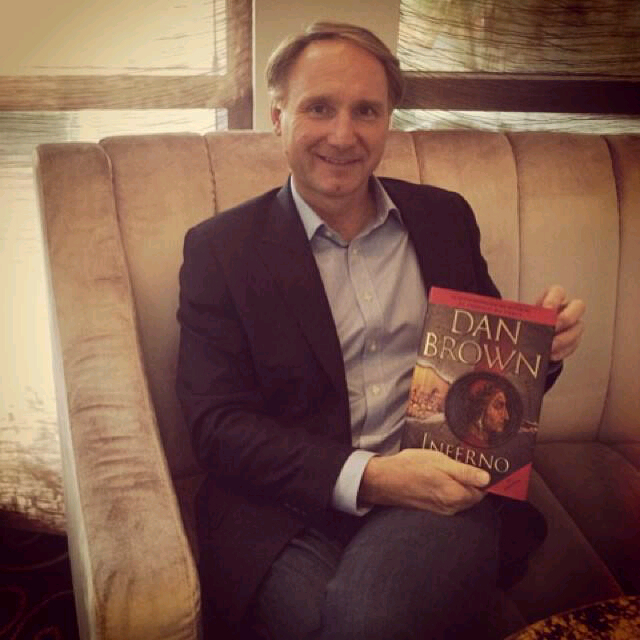 I enjoy reading novels and Dan Brown is one of my fave authors. I have read all apart from the recent one he wrote Inferno. I have a soft copy and that’s the reason I’m still stalling. If you want to read a fast paced book with your heart skipping beats please do open the Dan Browns. Ps I’ll also recommend those written by J.K Rowling! If your faith wavers ’cause you read a Dan Brown, then it’s certain ypu never had a faith. Absolutely nothing wrong with d guy’s books. They not only make interesting reads, they’r also very educative and thought-provoking. Yea,I know dats d part dat kinda scares ppl. Buh rili, I’m not a philosopher or anytin buh I think ppl shud give mur thot to d saying “I think therefore I am”. People don’t like to be bothered with things ds daiz. Hell,thinking is way too much work. They enjoy being handed things ; religion,faith,lifestyle,relationships,life itself etc. They take these tins and mur exactly as they are handed to dem and that’s why they feel very troubled weneva smtn like ‘inferno’ comes up. It just disturbs statusquo,lol. THINK. READ. READ DB! Haven’t really been a fan of Dan brown,but I have heard a lot of scary talks about a after effect of reading Dan browns book of which I haven’t seen anyone showing such effects. I think I’ll go read me some Dan brown books soon. Actually some books are better not read because they can be poisonous. Yet I do not necessarily categorise any of Dan Brown’s books as such. Yes he doesn’t write literary fiction but dude is good. I like what he did with the Silas character in Da Vinci Code for example. Dan Brown has an almost photographic precision when it comes to describing places. And his books always contain unique, fantastic ideas, not necessarily religious. I’ll surely recommend him again and again without batting an eyelid. P.S. Perhaps I might bat an eyelid at anything anti-Christian away. In the end its about sifting the chaff from the grain.